It’s the calm before the storm – pitchers and catchers report to spring training on February 13, with the full roster arriving on February 18. Minor league players get more time off – if they were not invited to major league camp, they report in early March. I suspect this is going to be a quiet week here on the blog, which is a good thing because I have another writing project that I need to finish. However, we’ll start our Rainiers position-by-position breakdowns next week. I’ll do six groups of players: starting pitchers, relief pitchers, catchers, corner infielders, middle infielders, and outfielders. I’ve already started thinking about the starting pitching situation and it’s a beast. In the meantime, there are a few Mariners and Rainiers related stories to link to – mostly as a result of the M’s FanFest, which was held this past weekend. I heard good reports from a few friends who attended. At The News Tribune, Ryan Divish caught up with Dustin Ackley at FanFest and wrote this feature. John McGrath wrote a column about 19-year-old Mariners shortstop prospect Nick Franklin. Larry LaRue provides a 2011 scouting report on Felix Hernandez. At the Seattle Times, Larry Stone gets to the bottom of the Chone Figgins to Oakland trade rumor. My gut feeling (based on no inside information): this is dead. Ex-Rainiers pitcher R.A. Dickey cashed in on his tremendous 2010 season by signing a two-year deal with the Mets. I suspect he won’t be spending all of that newfound cash on razor blades. Former Rainiers third baseman Greg Dobbs signed a minor league free agent contract with the Florida Marlins. Dobbs played for Tacoma from 2004-2006, and he was voted by the fans as the third baseman on the Tacoma Rainiers Team Of The Decade. I was absolutely shocked to learn that one of my favorite baseball writers, Rob Neyer, is leaving ESPN. Neyer’s espn.com column has been a staple of the web for so long, he remembers when the internet was just a series of tubes. In all seriousness, Neyer has influenced a generation of baseball writers on the web. Best of luck to my friend in his new gig – which I will link to, once I find out what it is. There will be scores of these, but Dave Cameron (of Fangraphs/USS Mariner/ESPN/Wall Street Journal) wrote the first “Thanks, Rob” column I saw today. KING 5 is out at the Cheney today, shooting stadium footage. They may have a piece on the construction in tonight’s 5:00 news. They call it the “Mariners Pre-Spring Training Media Luncheon” and its a late-January staple for Seattle baseball reporters. The team schedules it to coincide with the Hutch Award dinner and the Mariners FanFest, which always makes for some baseball news during Super Bowl week. The Mariners Media Relations & Player Development Departments invite representatives from the local minor league affiliates to attend. I drove up with three Rainiers co-workers, and members of the Everett Aqua Sox front office also attended. This event is always a wake-up call for me, as it means that it is time to really get cracking on my preparation for the upcoming season. The event is mostly about the Mariners, and manager Eric Wedge, General Manager Jack Z, Felix Hernandez, and trainer Rick Griffin all spoke. However, this year it appears that the Mariners are going to begin a youth movement, and there was more talk about minor league prospects than in the past. You can get all of the info on Wedge, Jack Z, and Felix from The News Tribune or Seattle Times, or by tuning into sports radio. But I’ll share a few tidbits that came up regarding the minor leagues. First, the Mariners Director of Player Development Pedro Grifol told an interesting anecdote that gives credence to the organization’s new emphasis on winning in the minor leagues. Grifol spoke about Michael Pineda’s playoff start in the California League two years ago. Pineda was pitching for High Desert against Rancho Cucamonga in a Class-A playoff game – part of a best-of-three series. Yes, a best-of-three first-round playoff game in the Class-A California League. Grifol went on to say (I paraphrase) that unless a minor leaguer played college ball in the Big-12, Pac-10 or SEC, he’s never played in a true pressure-packed situation. Minor league playoffs create that pressure element, which helps prepare a player for the major leagues. He went on to say that it’s particularly important for US players coming right out of high school, and for Latin American players who come out of tryout camps and sandlots. They need the experience of professional playoffs to help prepare them for the pressure of the major leagues. It was the first time I ever heard a MLB front office member really give a reasoned explanation why they wanted to win in the minor leagues. Usually it seems like they are paying lip-service to the idea, and you come away thinking all they really care about is that the first-round draft pick hits .300. This was refreshing. Griffin in his injury report said that Mike Carp (foot) and Matt Tuiasosopo (right elbow) each had minor surgeries right after the 2010 season, and both players are ready to go for spring training. Griffin also said that the current timetable for closer David Aardsma to return from hip surgery is the second week of the season. 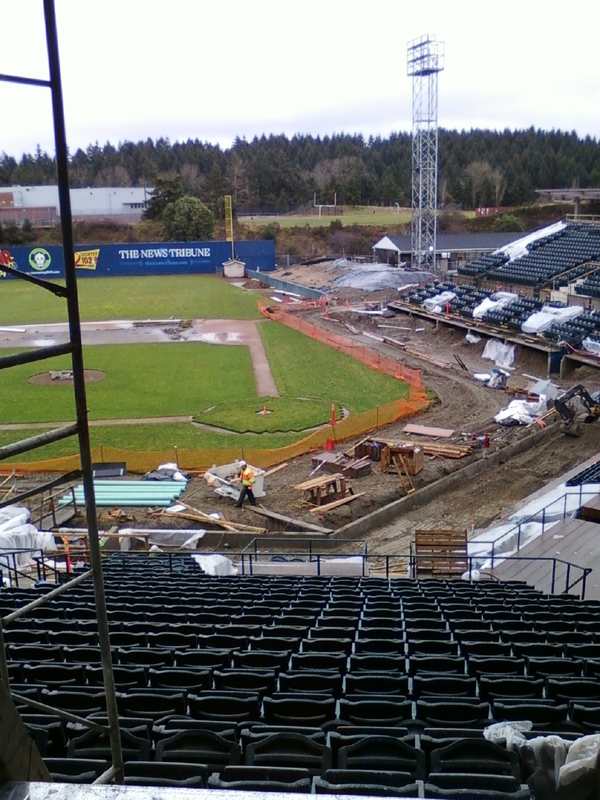 Since the Rainiers open on the road, that makes it unlikely that Aardsma would rehab at the new Cheney Stadium. There was lots of talk about Dustin Ackley and his acclimation to second base (last year was the first season he had ever played the position). Jack Z alluded to the addition of Robby Thompson to the major league coaching staff. Thompson is a player I watched a lot while growing up: he was an outstanding defensive second baseman who was known for his excellence in some of the minute details of the position – specifically making cutoff throws, and turning the pivot on the double play. Thompson’s instruction could really help refine Ackley’s defense. Ryan Divish grilled Grifol about the shortstop prospects: first, Grifol made it sound like Nick Franklin may jump to Double-A from low-A Clinton. Then Divish asked if Franklin had passed Carlos Triunfel on the “depth chart” and Grifol said “no.” So what does it mean? Perhaps Triunfel gets promoted to Tacoma even though he had an understandably rough 2010 season (he missed all of 2009 with a broken leg – Grifol was just happy that he played all year in 2010). Or maybe Triunfel stays at AA, and Franklin goes to High Desert. Who knows? That’s what spring training is for. We’ll talk more about the prospective Rainiers in position-by-position breakdowns over the next two months, but right now starting pitching looks especially backlogged: I count ten potential Tacoma starting pitchers before we even discuss promoting players who finished 2010 at Class-AA. Mariners Minor League Operations guru Hide Sueyoshi told me that catcher Eliezer Alfonzo signed as a free agent with Colorado. That one slipped under my radar. The Mariners were supposed to play an interleague series at Florida in June, but the series will be moved to Safeco because the Marlins got booted from their stadium in favor of… a U2 concert. The series will be at Safeco, but the Marlins will bat last, and pitchers will hit. It’s going to be kind of surreal, like the Rainiers PCL Championship Series “home” games in Memphis were. This Lookout Landing entry has more news from the event, including a picture of the patch that the Mariners will wear on their right sleeve to honor Dave Niehaus. A tasty lunch was served. For ESPN.com Insiders (subscription required*), Keith Law posted his thorough Top 100 Prospects package. Four Mariners made the cut: Ackley (7), Pineda (21), Franklin (53), and… at #100… Class-A outfielder James Jones. Mariner Central has a great Q&A with Conor Glassey of Baseball America. The topic is the Mariners farm system, and Glassey talks a lot about the younger kids at the lower levels. Here’s the proper news story on the Tucson Padres new logo and business operation. * on his Twitter, whenever anyone asks Law for the rankings for free, he tells them to “buy the cow.” I have no idea what this means, but I know that I love it. I wasn’t the only one who did a Cheney Stadium walk-through on Friday – John McGrath of The News Tribune was there, too. In addition to superior prose, McGrath’s story has some facts and quotes in it. KOMO 4 was there on Friday, too – so far I’ve only seen these three pictures, but they filmed a lot of areas, too. Mariners reliever Garrett Olson is an interesting guy – and Greg Johns caught up with him, and found out that Olson went on a massive trek through New Zealand this winter. Here’s the story. Larry Stone wrote about the big week coming up. I’ll be at the Mariners event on Thursday and will post about it in the afternoon. This came out over the weekend, but Geoff Baker’s long post about modern journalism and “scoops” was very interesting to me. Definitely a good read about how journalism has changed in the last 20 years. For those of you who can’t get enough me on my own blog (I’m talking to you, Mom! ), Lonnie over at Mariner Central did a Q&A with me. Lots of PCL stuff today, too. Most importantly, your Tucson Padres have gone live. I really like their logo – classically understated, a nod to the major league affiliate, with a totally awesome cactus. Big management news in Las Vegas, where the team is for sale, and Mr. Vegas Don Logan is trying to put together a new investment group. He passed the day-to-day operations to long-time employee and all-around good guy Chuck Johnson. We close today with a technological advancement that may revolutionize the beer-serving industry – and make stadium beer lines move faster. Check it out! Now that our smartest minds have solved this problem, it’s time to move on to the flying car. After the jump, a football bit that is total collegiate jingoism and has nothing to do with the Rainiers, baseball, or even the Pacific NW. I had my first Cheney Stadium walk-through on Friday afternoon, and I snapped a bunch of photos. Our group got to see the inside of the new club and suite levels, including the Summit Club, and also the new main concession stand. 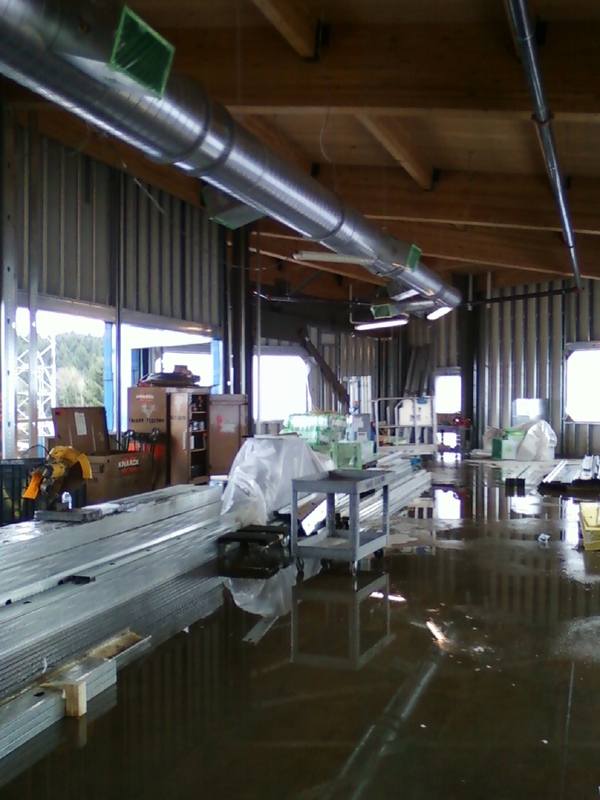 We did not get to see the new Rainiers clubhouse, where serious work was underway. As always, you can expand the photos by clicking on them. We entered the stadium on the third base side, near where the old administrative office used to be. Their used to be an incline in the concourse as you walked around the outside of the park. 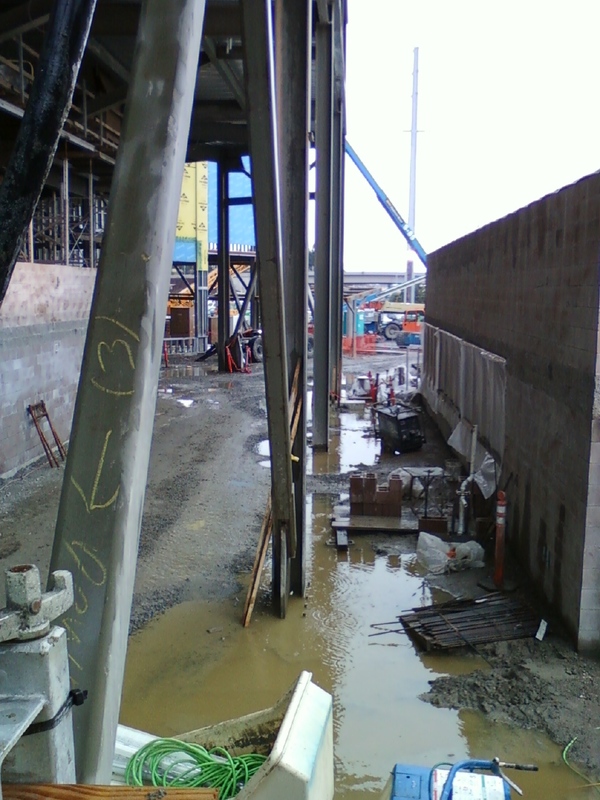 That area has been excavated and will be flat now – resulting in part of the concourse being below parking lot level. Looking towards parking lot, third base side. 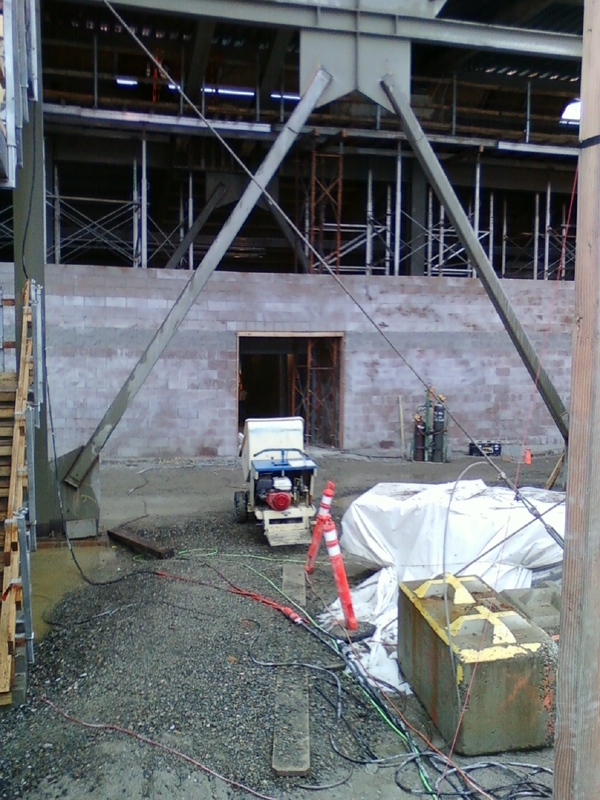 The worker is coming out of the side door of a new concession stand. Here’s the new third base concourse, walking towards home plate. On the right is the same concession stand in the previous photo. Here’s something we can all enjoy: new bathrooms. We walked up one of the four stairways to the second level – which is located a few feet up from the top row of seats. 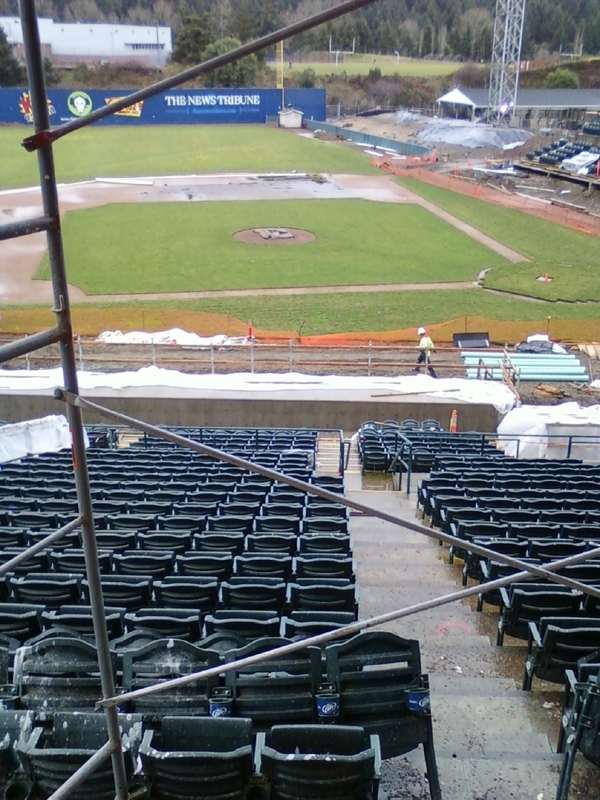 Here is a good look from that level, down towards the home plate and first base seats. You can see that they are starting to build the new field level Dugout Club seats, and also the new, much longer dugouts are being constructed. About five feet of foul territory will be replaced by the new seats, bringing fans even closer to the plate. The Rainiers are now in the third base dugout. In the distance you can see the hill that will become the grass berm. The second level will include a couple of suites, including the Owner’s Box. The second level also houses the Press Box, three broadcasting booths (Home Radio, Visiting Radio, and TV), and our in-game command center (scoreboard operators, video room, P.A. announcer, etc). 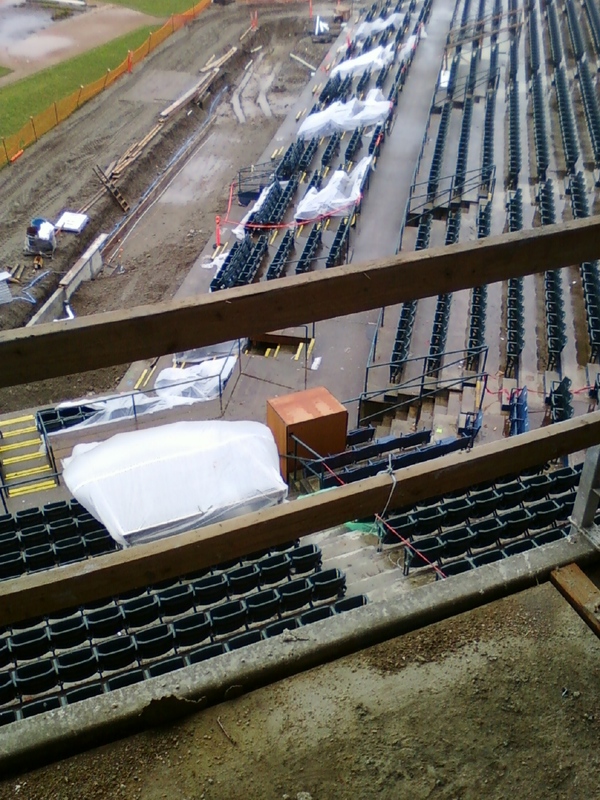 Directly behind home plate on the second level, there is an open landing right above the top row of seats. I believe (but I’m not certain) that it’s going to be a standing-room area anyone can access. This little shelf needs a name. On the first base side of the second floor will be the team offices. One or two lucky ones will have a view of the field, while most will have a view of the parking lot Mount Rainier. Formerly called the Gold Club and located in a tent, the new Summit Club is going to be awesome. 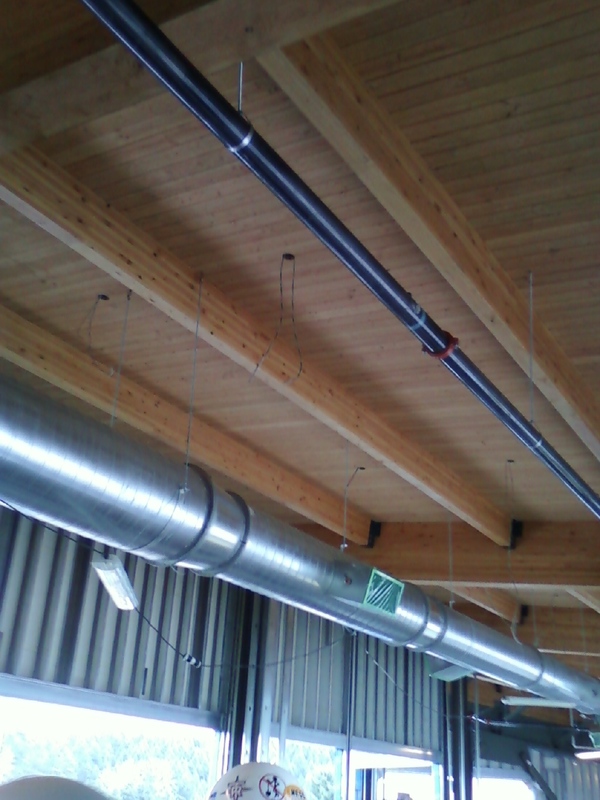 Check out the wooden roof. The design team is really proud of this, with the wood roof acting as a nod to Ben Cheney and the Pacific Northwest’s timber industry. 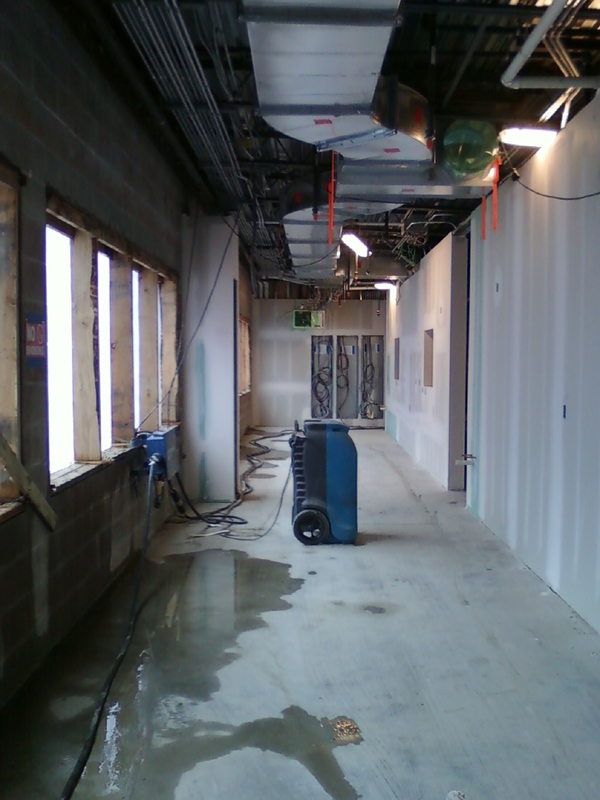 The third floor suites, along with the Summit Club, will have a row or two of outdoor seating. 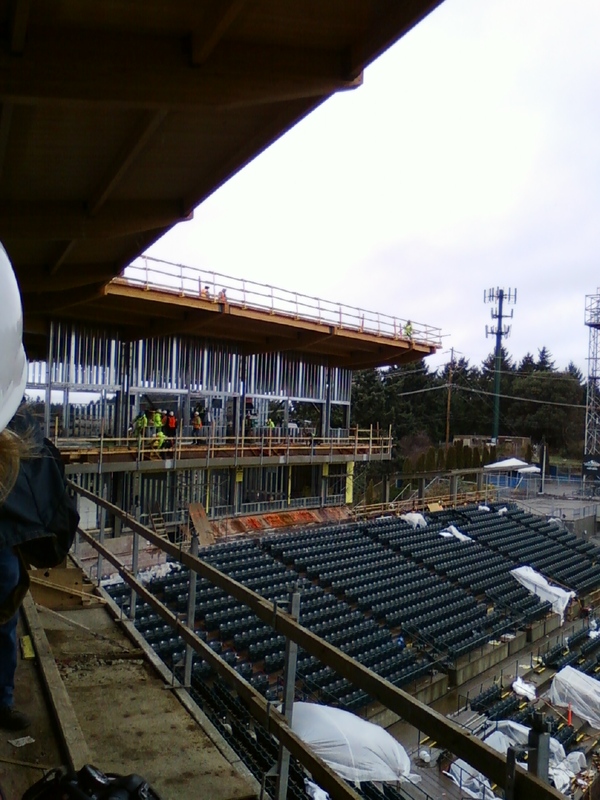 From Summit Club towards first base side. From Summit Club towards the plate. It's very similar to the view from my old booth on the roof. So you get your Summit Club tickets, and it just happens to be the day the Rainiers get trounced 9-0. Yikes! Oh, well – they also have windows looking out back, towards Mount Rainier. 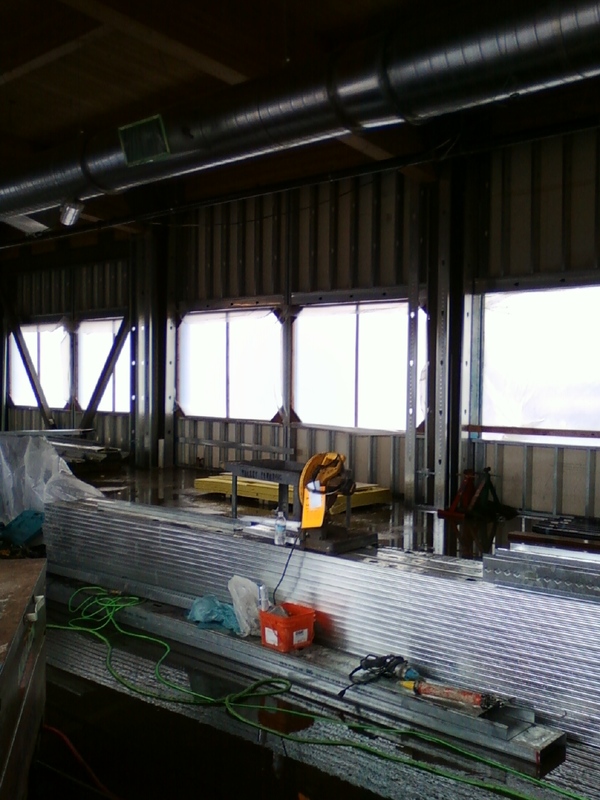 Windows on both sides will give the Summit Club a very bright, open feel. 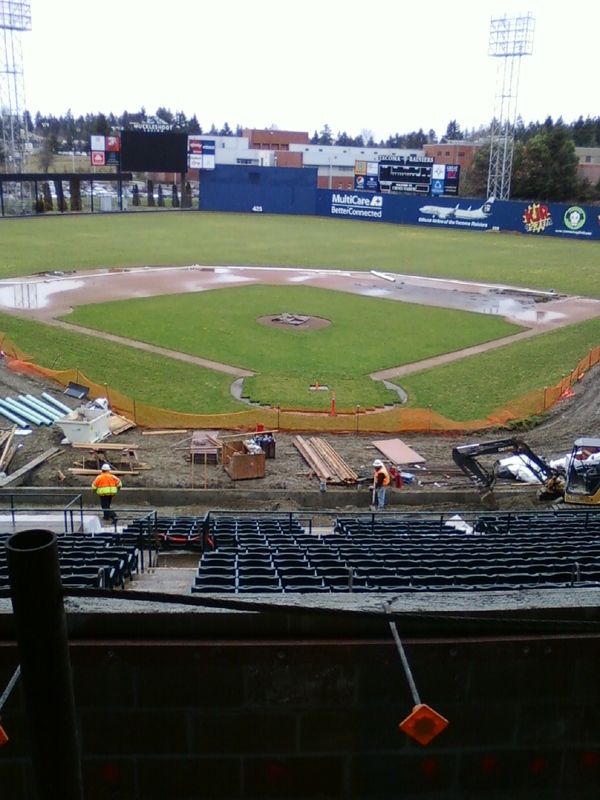 Here’s a good shot of the work being done on the Rainiers third base dugout. 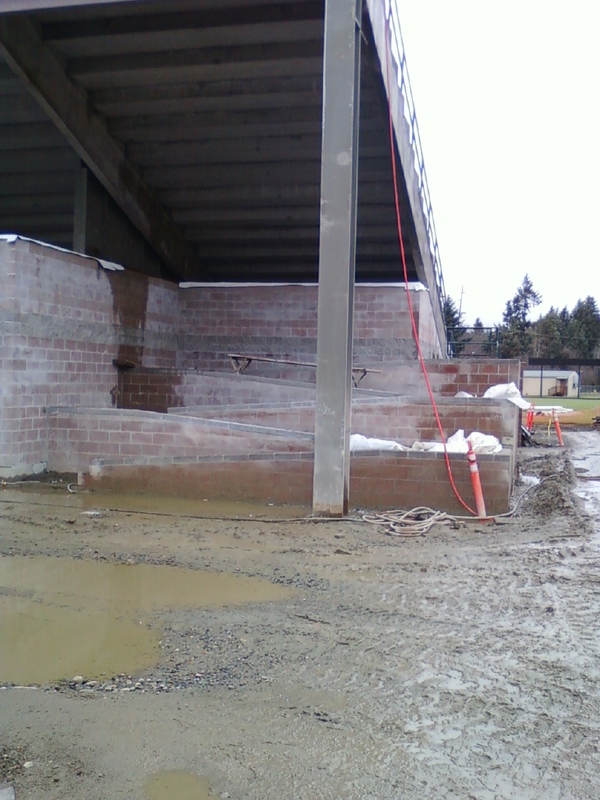 You can see plastic wrap over the tunnel that will lead into the new home clubhouse, located underneath the seats. Note that the popular party decks are staying. The Ben Cheney statue is in the wooden box. Do not open until April 15. We walked back downstairs to the outside of the stadium. There will be a main entrance unlike anything the stadium has ever had before. Here is a look from out front, straight up at the roof. 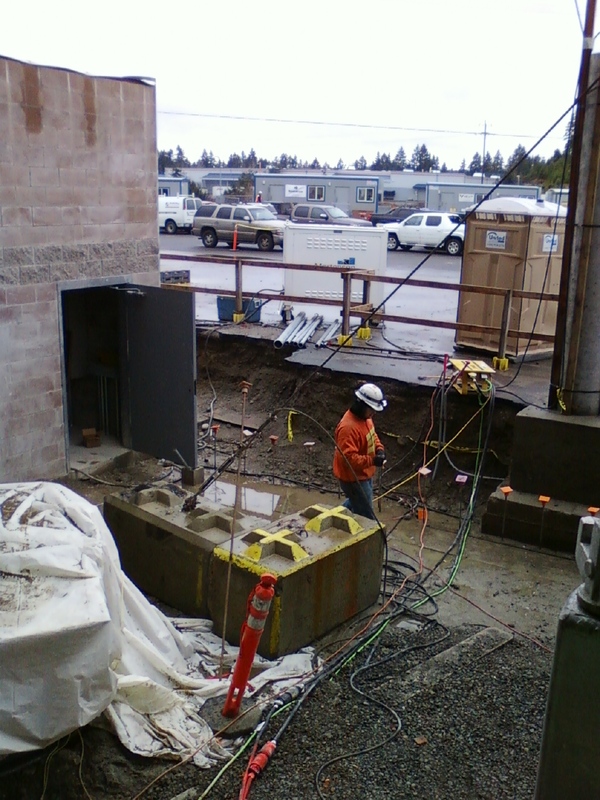 Elevators will be located at the main entrance. We couldn’t walk into the main entrance because cranes were lifting gigantic, heavy things overhead. Instead, we went somewhere safer: the new main concessions stand, which is now on the first base side behind the seating bowl. There will be many, many more points-of-sale which will cut down on the long lines. Also, there will be smaller stands throughout the park, including portable units. Is that a pile of peanut shells on the ground? Already? Here is an example of Cheney’s new A.D.A.-compliant ramps. There are elevators to the upper levels, ramps into the lower seating bowl, and on the first-base side a zig-zag ramp for wheelchair users who prefer more of a Formula One approach. This side of the stadium used to be wheelchair inaccessible. 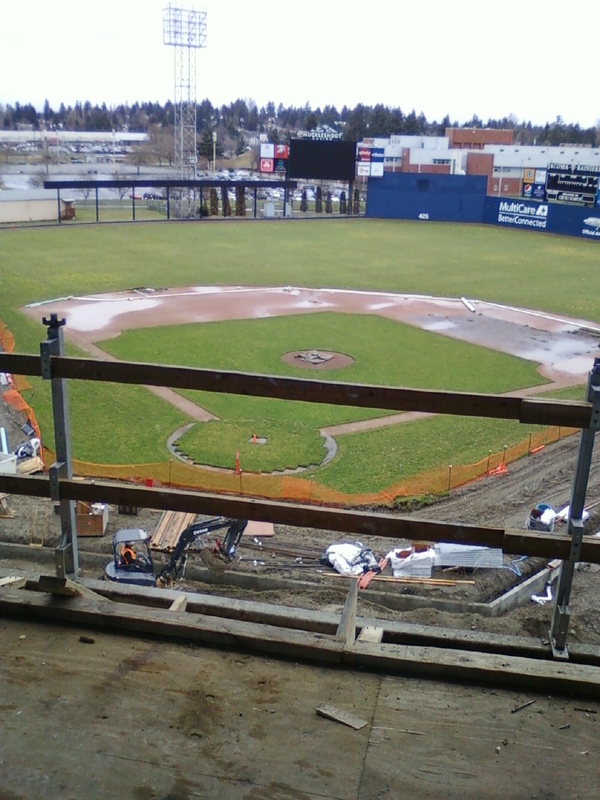 Here is a pretty photo of a massive mud pit that will become a grassy lawn behind the first base berm. In the background is the old batting cage, which is going to be transformed into a barbecue area for group outings. 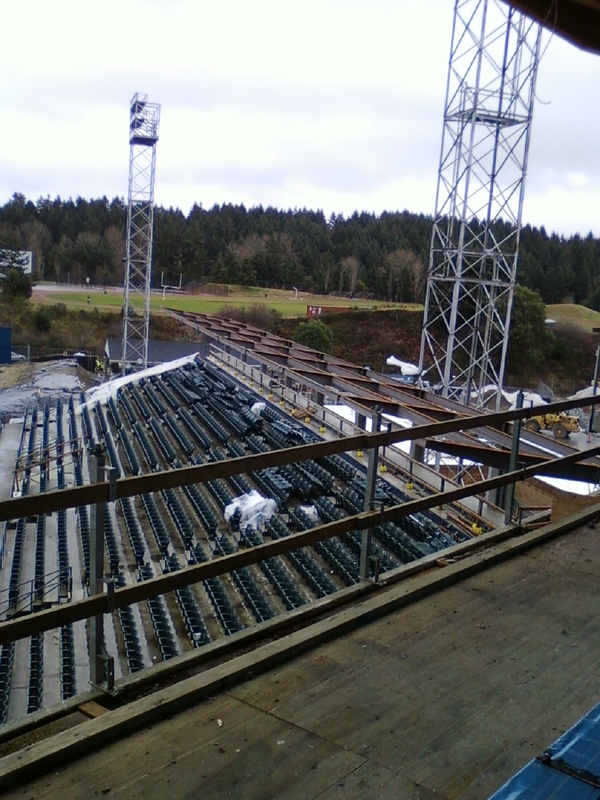 The new batting cage will be underneath the seats near the Rainiers clubhouse. 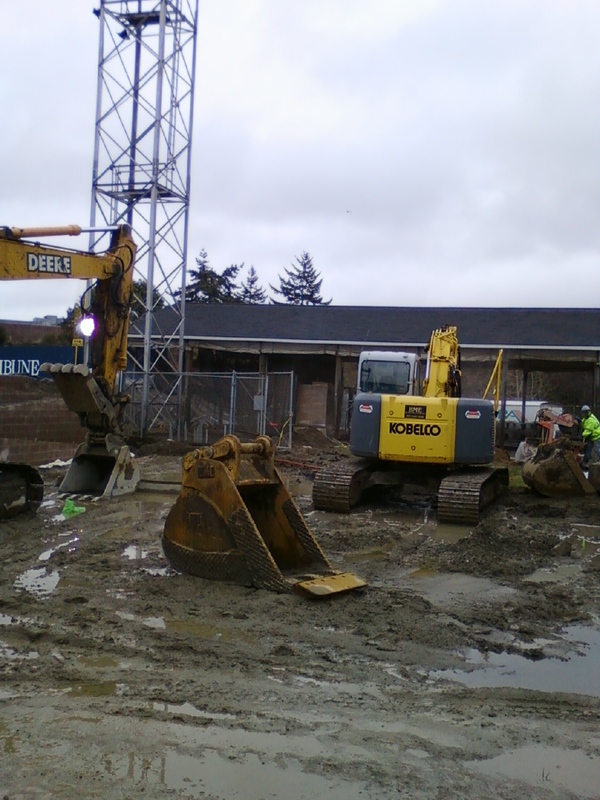 Does anything make men between the ages of 1 and 100 happier than bulldozers in mud? 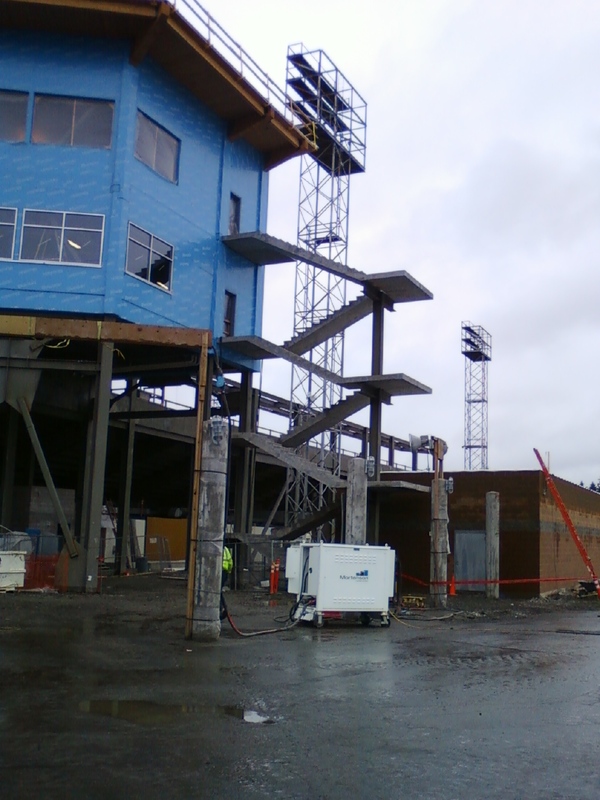 The first base side outdoor stairway looks stark. I presume they will add handrails. They are replacing the lights in all of the towers. The towers are still the original light standards that were shipped up from San Francisco’s Seals Stadium in 1960, but the actual light outlets are going to be modernized, and brought up to current Triple-A Baseball standards. This will make the entire field brighter – which is good for the players and the fans. That’s everything I got to see on Friday. I still have not seen the home clubhouse area, or the inside of the main entrance, and I haven’t been able to walk through the seating areas. I expect to be doing a couple more of these photo-blogs as progress is made in these areas. Special thanks to Mortenson Construction for showing us around. 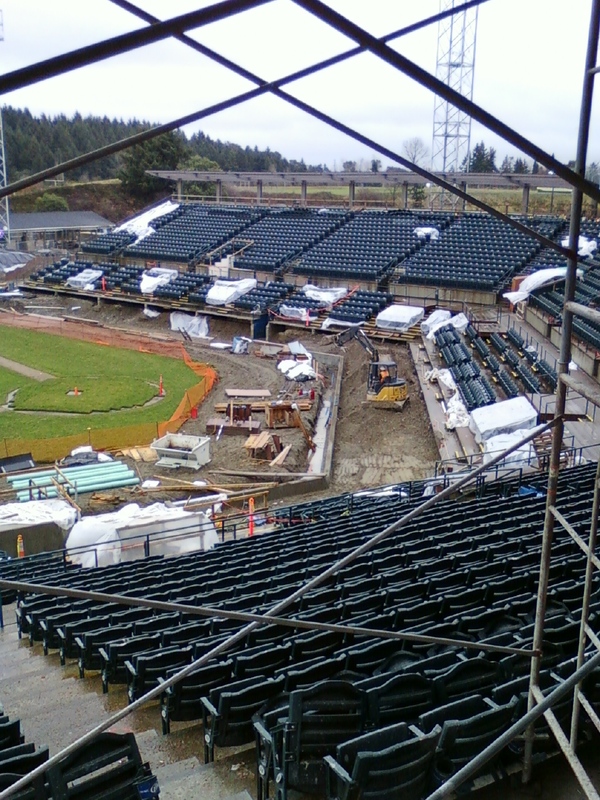 Looking for more Cheney Stadium photos? Check this gallery on the Rainiers official site. Meanwhile, down in Portland… Ugh. It causes a violent reaction when I look at it. You have been forewarned. 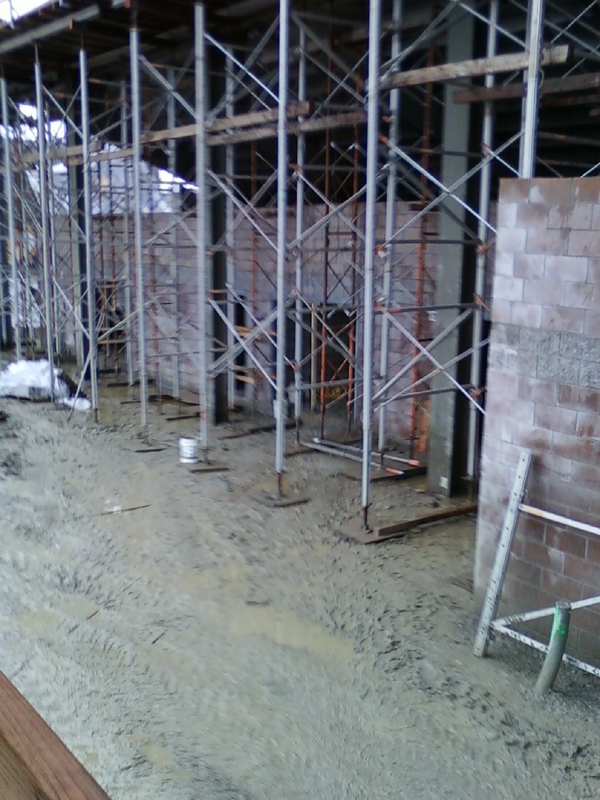 It was a big day in Rainiers radio world today – I had my first walk-through inside the new Cheney Stadium press and suite levels. It is really impressive – the new Summit Club is going to be spectacular. I will have a full “photo-blog” – complete with bad pictures and not-so-witty commentary – on Monday. But, for me, the chance to stand in the space that will soon be my new radio booth today was a real treat. It’s going to be much larger than before – two people will actually fit comfortably inside! There will be room for bookshelves, which is awesome, and plenty of counter-space. Also, the floorboards won’t be warped and rotten, and the walls won’t be coated in mold, the ceiling won’t leak, and it won’t shake dangerously every time the breeze increases. 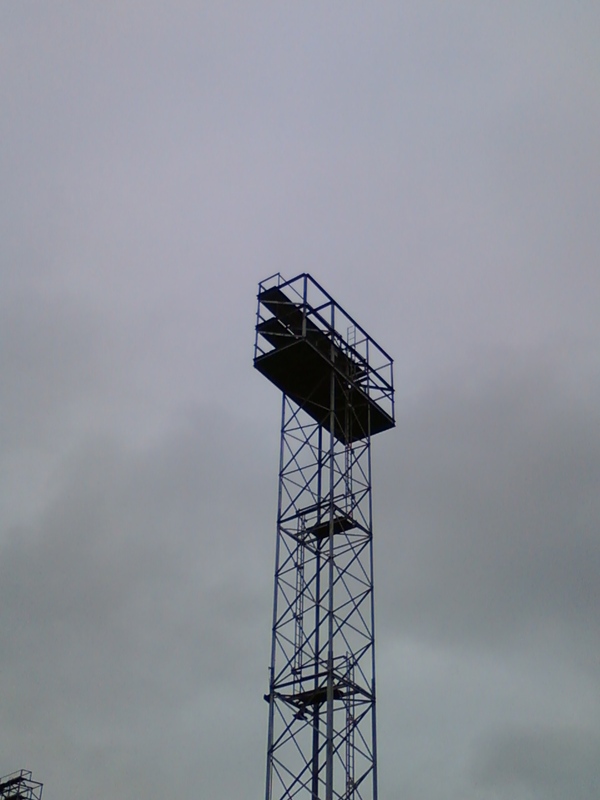 The location is slightly different – a tad bit towards the third base side, lower to the ground, and few feet further back than the old position. 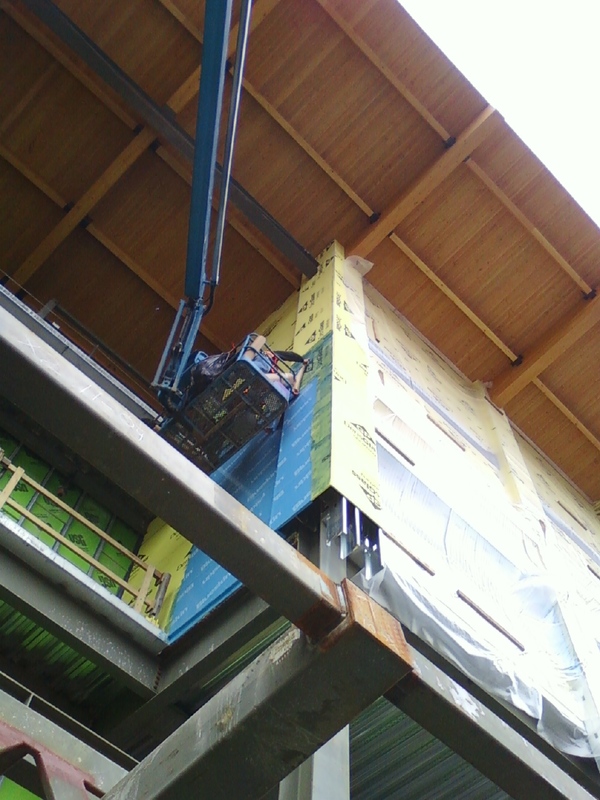 Hey buddy - move that scaffolding! Can't you see I'm broadcasting here? The Seattle Mariners website has a cool video-interview with Rainiers starting pitcher Blake Beavan. You read it here first: Beavan is an excellent bet to get the ball in the Rainiers season-opener on April 7 in Sacramento. Sad news out of Fresno: former major league all-star Gus Zernial passed away yesterday at age 87. Zernial led the AL in home runs and RBI in 1951. A Texas native, Zernial settled in Clovis, CA and was a fixture at the ballpark in Fresno in recent years – even serving as a public ambassador for the Grizzlies. Here’s an entertaining story on the Kansas City Royals scout who covers the nation of Columbia. An adventurous job, for sure. Over at Lookout Landing, Jeff Sullivan walked down memory lane to recall the Ron Wright story. Texas Rangers senior vice president Jay Miller was elected into the New Orleans Professional Baseball Hall of Fame. Miller left a big imprint on the PCL: most recently as the head of the Round Rock Express, but prior to that Miller oversaw the construction of Zephyr Field in New Orleans. Congratulations to my long-time pal Doug Scopel, who was promoted to Assistant General Manager of the Nashville Sounds. Way to go, Scopes – I remember when your title was World’s Tallest Intern. MLB.com’s “Prospect Watch” lists the top second base prospects in the minor leagues, and they lead off with our guy – Dustin Ackley. Former Rainiers pitcher Gil Meche retired yesterday, after over nine years of major league career. Meche pitched in a handfull of games for the Rainiers in 1999, 2000, and 2004. Four years ago Meche signed a big free agent contract with Kansas City and, in retiring, he actually walked away from about $12 million in guaranteed salary for 2011. Joe Posnanski wrote a good blog post on Meche. Apparently, trouble has found Mariners outfielder Milton Bradley once again. Geoff Baker of the Seattle Times has the story. Larry Stone wrote about how difficult it is for a baseball team to void a player’s contract. The Mariners signed a pitcher with a unique background in Keli’i Zablan. Zablan was an infielder for four years in college, but his pro prospects are on the mound. He may never reach Triple-A, but it is a good story to show that players can come from all kinds of backgrounds – there isn’t one true path to professional baseball. The M’s have beefed up the list of autograph signers for their annual FanFest, coming up on January 29-30. Here’s all of the info. Former Rainiers reliever Brian Fuentes signed a two-year contract with the Oakland A’s. He’s really had a nice career. Ex-Rainiers infielder (and South Kitsap High School product) Willie Bloomquist finalized his contract with the Arizona Diamondbacks. It’s that time of year when young major league players who are arbitration-eligible come to contract agreements – so you see lots recent Rainiers players in the news, with their contract numbers. Adam Jones and Shin-Soo Choo each got nice raises. In particular, I am happy to see that Mike Morse joined the seven-figure club. This is a great story about former #1 pick Matt Anderson, who is… shall we say… a colorful character. He once amused the entire Tacoma Rainiers team when, on a frigid day in Colorado Springs, he warmed up in the bullpen – to enter the game; he was going max-effort – with his thick winter Sky Sox jacket on. He did not remove the jacket until he ran in from the bullpen, reached the mound, and took the ball from his manager. I was interested to see that the Oakland A’s designated Clayton Mortensen for assignment. I’m not sure how much Mortensen can contribute in the majors, but the Gonzaga product has been one of the better starting pitchers in Triple-A for two years now (remember, a low-4.00 ERA is good for a starter in the PCL). Will anybody claim him and add him to their 40-man major league roster? 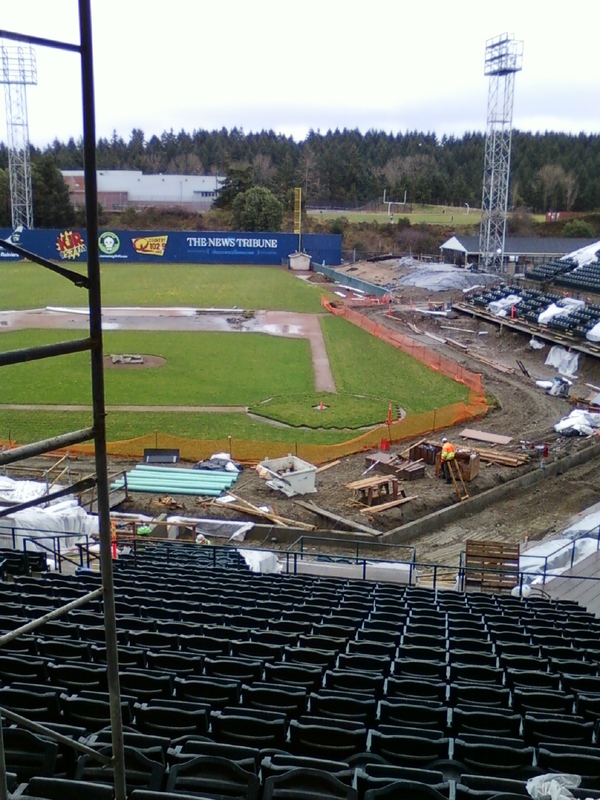 I have a Cheney Stadium walk-through scheduled for Friday, so I’ll post some photos and commentary soon. First of all, we now have a F.A.Q. (that’s Frequently Asked Questions for the acronymically challenged). You can find it at the top of the page, or on the right. 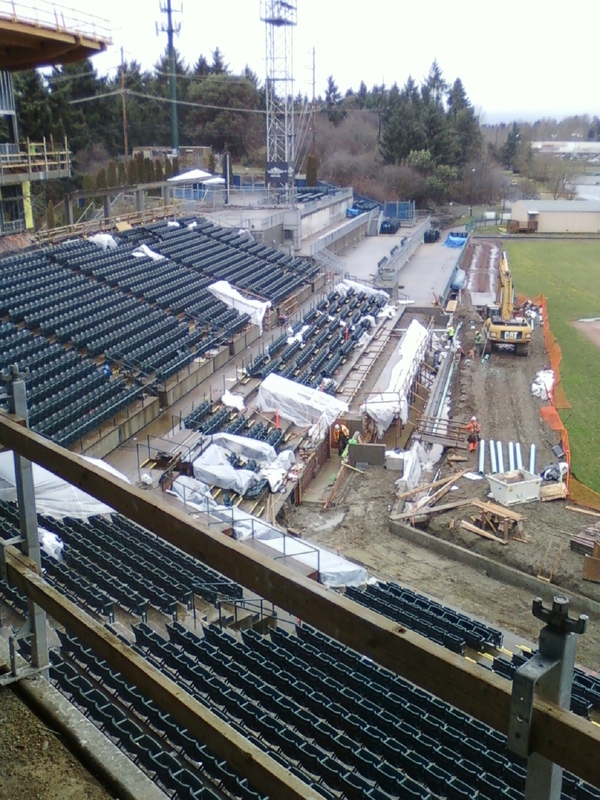 Second, part two of “How Cheney Stadium Got Its Groove Back” is now online. Third, pitcher Ian Snell, a member of the 2010 PCL Champion Rainiers, signed a free agent contract with the St. Louis Cardinals. It’s a minor league deal with an invite to big league camp. You are currently browsing the Booth, Justice and the American Pastime blog archives for January, 2011.